This Thursday, December 23rd at 8pm, former Columbus Music Hall owner and jazz ambassador, Becky Ogden, continues a holiday tradition at her Bungalow Jazz location with a “Red Hot Holiday Stomp”. The jazz performance features the Todd Stoll Septet. 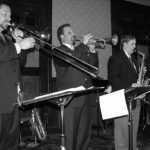 Formed in 2004 by trumpeter and educator Todd Stoll, the Todd Stoll Septet has been critically acclaimed for club performances around central Ohio. There is no reserved seating, but Becky will take your attendance reservation. Reservations cannot be prepaid; but will be happy to take your CASH donation at the door. You can reserve on line, by clicking on our RESERVATIONS page, by email: msrebecca@sbcglobal.net, or by phone: 614-397-5540. BUNGALOW JAZZ is located at 2539 East Fifth Avenue in Columbus, between the intersection of I-670 with Fifth Avenue, and North Cassady Avenue. But access to the house is from Margaret Avenue.